In the Muslim Middle East, women have often joined men in protest movements. When Iraq invaded Kuwait in 1990, women took part in street demonstrations in the tiny gulf country. Over the years, images of Palestinian women, fists raised in anger against Israel and tears flowing in despair over children and husbands killed, have become a staple of that conflict. But Iran's protests have elevated such images to a new level. 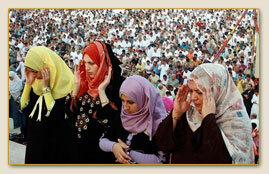 In the Muslim Middle East, women have often joined men in protest movements. For years, women’s defiance in Iran came in carefully planned flashes of hair under their head scarves, in brightly painted fingernails, and in trendy clothing that could be glimpsed under bulky coats and cloaks. But these small acts of rebellion against the theocratic government have been quickly eclipsed in the wake of the disputed June 12 presidential elections. 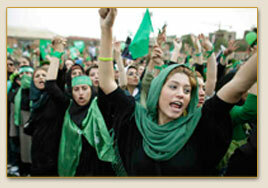 In their place came images of Iranian women marching alongside men, or of their scuffles with burly militiamen. It is a role, say Iranian women and experts, that few seem willing to give up, and one that is likely to present even greater challenges to President Mahmoud Ahmadinejad’s hard-line government in the wake of the recent violence and protests. "My dream is to see my sisters well-educated in a peaceful Afghanistan." After the fall of the Taliban in 2002, Sadiqa Basiri Saleem returned home from a refugee camp in Pakistan to find 150,000 girls in her eastern Afghanistan province lacking the resources, security and support to go to school. Sadiqa and three other women pooled their money together and founded the Oruj Learning Center, which provided uniforms, supplies, and funding for 36 girls to study in an abandoned mosque. In just six years, the Oruj Learning Center has grown in size, scope, and promise. Last year, Oruj provided for the education of over 2,700 girls in six schools and 200 women at four literacy centers throughout Wardak province. The center has launched a program for gifted students, focusing on English and computer skills. Its Family Welfare Center for the Elimination of Violence Against Women, a domestic violence prevention project, provides services to 14,000 Afghan women, trains government staff on domestic violence and encourages spiritual leaders to discuss women’s issues constructively. The center supports training programs for teachers and human rights awareness seminars for the public. Mariam Jami literally risks her life every day to make jam. She began jam-making five years ago in her village in Gozara district, 15 miles from Herat, using local fruit and vegetables. It was so successful she soon had 20 women working for her. She then saw adverts for entrepreneurs to compete in an Afghan version of Dragons’ Den. “I thought, why not?” she laughs. So as not to be recognized, she wore a hijab and dark glasses. She came second, winning $14,000 — a vast amount in a country where police are paid less than $100 a month. On returning home to her village, she found men, under orders from an ex government minister now allied to the Taliban, had beaten up her husband and brother. “They threatened me not to go on TV and demanded part of the prize money,” she says. But she would not give up: Mariam Jami continues to make jam to this day. "It's difficult, but we are pioneers..."
Jeddah, Saudi Arabia - In red-and-white uniforms which cover all but their hands and face, Saudi women pioneers with their basketballs and footballs are puncturing strict religious taboos. Jeddah United train four times a week away from the prying eyes of men. Yet just playing basketball is revolutionary in Saudi Arabia, where an ultra-conservative version of Islam means women can’t go out in public without guardians, can not drive, and can’t even attend men’s sports events. "The image of a Saudi woman covered from her head to toe is false," team captain Lina al-Maina told AFP. "She has another side, more dynamic... , one of women who are beating challenges one after another without overstepping the rules and laws of the country… Our message is that Saudi women should be able to take part in sports, like everywhere around the world." 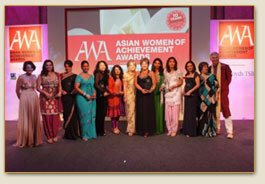 The achievements of ten Asian women were recognized at a glittering awards ceremony in London. Now in their tenth year, the Asian Women of Achievement Awards recognize and celebrate all levels of achievement made by Asian women in the UK - whether professional or personal - within the commercial, professional, artistic and humanitarian sectors. The judges said this year’s winners were some of the most impressive and inspiring individuals ever to be honored in the program’s history. The overall winner was businesswoman Vin Murria, “perfect ambassador and role model for Asian women in Britain,” who set up a foundation to support the education of children in India. The Social and Humanitarian Award went to Shaista Gohir from Muslim Women’s Network, who as a member of the National Muslim Women’s Advisory Group also advises government. "Encouragement for those seeking to hold the state accountable"
The state’s duty to protect the right to life has been applied in a domestic violence context for the first time in Turkey. Last week, the European Court of Human Rights made an important ruling against the government of Turkey for failure to protect Nahide Opuz and her mother against Opuz’s violent ex-husband. Although the legal principle of the state’s duty to protect the “right to life” of its citizens has been with us for some time, it has never before been applied in a domestic violence context. The judgment was also significant because it found the Turkish government to be in breach of article 14 of the ECHR – the prohibition of discrimination – because the violence suffered by the women was “gender-based,” it amounted to a form of discrimination against women. A first. Cairo – Egypt’s parliament has passed a law allocating a quota of 64 seats in the lower house to women, in what a minister said on Monday was aimed at promoting their role in society. The new law adopted on Sunday will give women more than 12 percent of the seats in an expanded parliament after the next election due in 2010, Minister of Legal and Parliamentary Affairs Mufid Shehab said. “The law ensures parity for women and promotes their role in society, as stipulated by the International Convention on the Elimination of All Forms of Discrimination against Women, which Egypt has signed,” Shehab said.